Why go birding in Northwestern California? BIRD DIVERSITY: Almost 480 species have been recorded in both Humboldt and Del Norte Counties! Get an idea of the species that occur, and have occurred here by looking at the eBird bar charts for both counties. If you are looking to see some "lifers" found only in the Western United States look at the "Species of Interest Page." It's generally not difficult to find over 100 species in a day year-round by visiting various habitats, especially along the coastal slope. HABITAT DIVERSITY: We are best known for our ancient Coast Redwood forests that house the worlds tallest and largest trees but there are so many more habitats that are more attractive to birds and birders. We have the largest coastal lagoons (Lakes Earl and Talowa) in the Western United States that are important to migrating shorebirds and wintering waterfowl. Humboldt Bay is a Globally Important Bird Area due to the millions of shorebirds and thousands of Black Brant that use it to refuel during their migration and is equally important to the thousands of waterfowl and shorebirds that winter here. The Arcata Marsh and Wildlife Sanctuary, the most popular birding location in Northwestern California has recorded 322 species within its' 307 acres! We have very accessible montane habitats where desired species like Mountain Quail, Sooty Grouse, White-headed Woodpeckers, and Hermit Warblers are found regularly. Many of our rivers have long swaths of quality riparian habitat important to many summer breeding songbirds. Lastly....we have GORGEOUS SCENERY to look at while birding! LESS PEOPLE = LESS TRAFFIC: In so many popular birding locations in large metropolitan areas (e.g., the Bay Area, coastal Southern California) you have to deal with traffic and congestion so often that it cuts into important birding time. Here in Northwestern California we have a pretty low population that is overall very rural = much less traffic and more birding time! SUM THAT ALL UP and you realize that there aren't many places in California that you can go birding where you have the combination of great species diversity, lots of unspoiled birding habitat, beautiful scenery, no traffic, and few people! It's a winning combination! WELCOME! Fowlerope Birding Tours is a local company based in Humboldt County, California that specializes in guiding birders on custom tours in Humboldt and Del Norte Counties in Northwestern California along the Redwood Coast and other areas in the Golden State. What kind of birding are you interested in doing? Target Birding: Do have a particular species that you need to add to your life list? Maybe you would like to try and see one of the species listed on the Species of Interest page? Build Birding Skills: Are you a novice or casual birder that would like to improve your birding skills? We can work on bird songs and calls, general identification topics, status and distribution, fall shorebirds, warblers, winter gulls? Maybe you are a more advanced birder that has never birded in the area and want to get a quick jump start on learning Northwestern California birds? Let's just go birding! Maybe you just want to go out with a local expert and have them show you around some of the best birding hotspots in the area for a day or two and see what we see? 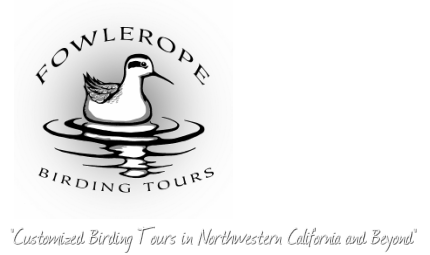 Please check the Rates and Services page to see how affordable Fowlerope Birding Tours custom tours are and then contact us to book your custom tour or inquire about more info regarding birds and birding in Northwestern California! Thanks for visiting and hope to help you find some of your needed birds here in Northwestern California! Sooty Grouse 12-13 May 2014 from Fowlerope Birding on Vimeo.